Clairemont Real Estate Market in ZIP Code 92117 only and not taking into consideration ZIP CODE’s 92110 and 92111 has the following data. Currently on August 3rd, 2018 there are 60 Single Family Detached Homes on the Market in 92117. The Median Home Price of the homes on the market is $772,000. Average days on market for the 60 homes currently for sale is 25 days and the average list price is $824,195. The average square feet of the homes is 1,665 sq. ft. and average lot square feet is 7,469 sq. ft. Median home price for pending homes in Clairemont is $749,000. There are 35 single family homes currently in escrow. The average price for these “in escrow” properties is $756,000 with an average days on market of 14 days. The average square feet for the homes are 1,522 sq. ft. and the average lot square feet is 14,597 sq.ft. 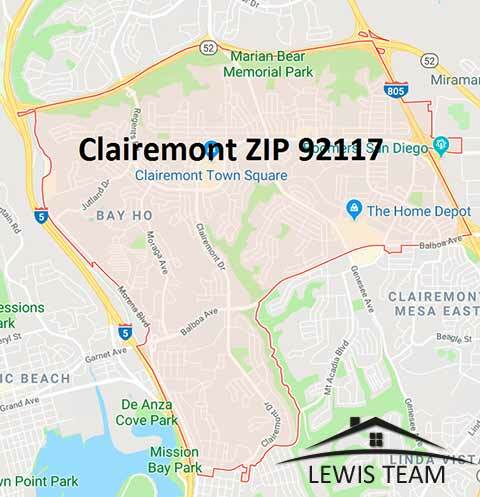 In July 2018 there were 36 sold homes that closed escrow in 92117 Clairemont. The median sold price was $690,000. The home in the middle of the pack was in the Mount Streets on 4802 Mount La Palma. The average sold price of the 36 homes that sold in July of 2018 was $756,339 and the average days on market was 13 days. The average home square feet was 1,578 sq. ft. and the average lot square feet was 7,436 sq. ft. 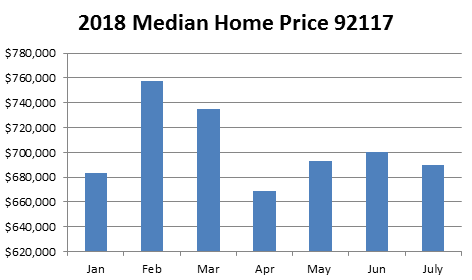 The chart shows median home prices in Clairemont for 2018. Interested in selling your Clairemont home? Call me. Interested in buying a home in Clairemont? Call me. Dawn Lewis Clairemont Real Estate Expert and resident.